Ultimate flavor in the garlic wing realm! It will be a hit with all your friends and family and they are easy to make. 2. Line a cookie sheet with foil, this will make clean up much easier. 3. 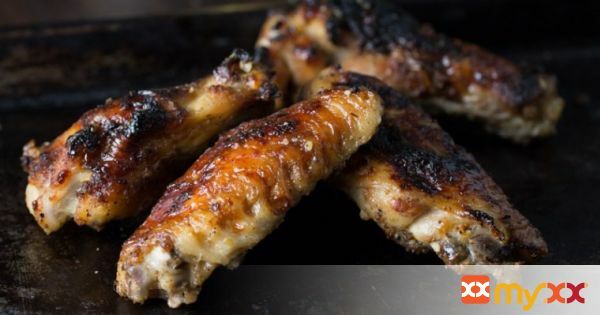 Pat chicken wings dry with paper towel and then place in a large bowl. 4. Sprinkle all the seasonings and sauces over the wings. Toss with your hands being sure all wings are completely coated evenly. 5. Place wings on parchment lined cookie sheet and then place in preheated 500 degree oven. 6. After 15 minutes, turn oven down to 375 degrees continue to bake for another 40 minutes. 7. Turn wings over and bake for 15 more minutes. 8. Once wings are roasted place them on a hot grill for 10 minutes, turning several times to crisp them nicely. 9. Coat with ½ cup of your favorite bbq sauce, hot sauce, sweet & sour sauce or what ever you like. These are really so good you don't even have to sauce them if you prefer. Serve and be ready for amazing!